I’m big on accountability. I can’t say that I’ve always been, but it recently became very important to me. I noticed the emphasis on this personal characteristic since having to start disciplining my son. Like I’ve mentioned before, he’s of preschool age and with that comes a newly developed understanding of right and wrong. Of course, it doesn’t automatically mean that once a child turns four they will better understand the difference like an adult does. I’m cognizant that it happens at different ages. In attempting to be in sync with my son’s development — it’s hard to be ahead of it — I have found myself adjusting my discipline level according to his growth. (I should say we have because a lot of this parenting labor wouldn’t be as successful as it is without my husband’s support and reinforcement. Part of the credit goes to him.) In my case, I’ve noticed that I’ve had to adjust my lifestyle based on what kind of reactions and behaviors my son is reflecting back to me. In the short time of being a mother, I’ve confirmed that my children are great little mirrors for my own attitude. Understanding this has opened a new parenting portal for me. Let me explain. It can be overwhelming to thinking of all the positive traits I want to teach my children, so I try and focus on one at a time. (In this post, I’m focusing on accountability.) Where or how do I start? I’ve learned the easiest way for me to teach my children is to model the behavior for them. An example of what this could look like — remember to adjust and apply according to your family’s needs — is apologizing to my children. Yes, this means apologizing to my one-year-old daughter, too. Let me be clear on what I apologize for. The two things I often apologize for is overreacting and losing my temper. (Gasp! Yes, I lose my temper. I am human, too. I don’t have it together all the time. Who’s with me?) I get snapped out of my grouchiness when my four-year-old tells me, “Mom, just relax. You have to remember to breathe.” Talk about feeling like an immature adult throwing a tantrum! My intention in apologizing to my son is for him to see it as normal to take accountability for his emotions and actions. My intention in apologizing to my one-year-old daughter is for my son to see me apologize to someone other than him; I want him to witness an apology as a bystander instead of a participant in the situation. It’s proven positive so far as I’ve heard him apologize to other people in addition to me. Ultimately, I want my son to have the confidence to establish a communicative relationship with anyone he meets, not only family. 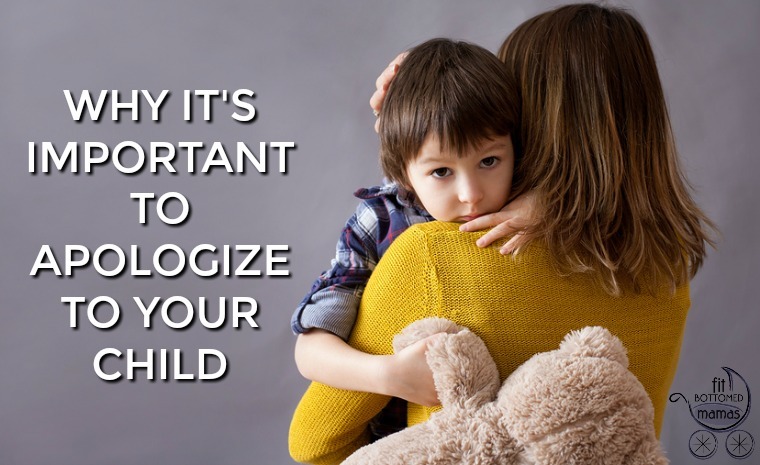 It is important for me to apologize to my children; however, that doesn’t mean that I believe I will always need to. What I do not apologize for are the moments where my son feels the need to interrupt because he insists his wants are more important. (Notice that I used “wants” and not “needs”.) For example, I do not apologize to my son if he’s attempting to interrupt an important conversation I am having simply because he wants to watch television. When this happens, I pause my conversation, come down to his eye level, and let him know that he needs to be patient. No apologizing about how I am not listening to him needed. After my conversation, I then explain to him why I did not acknowledge his requests at the moment he was asking and thank him for being patient. Children are little sponges. They are capable of picking up on positive behaviors as fast as negative ones. I know it’s easier said than done, but sincerely I believe that all it takes is constant reinforcement, which means that as parents — the people that greatly influence children — have to model it genuinely and always. The timing of this post is perfect as for my four year old daughter “sorry” really does seem to be the hardest word! If she can avoid it she will and if she absolutely has to say it she says it in a distorted almost not understandable voice. Very frustrating (although also hilarious if I’m not completely mad at her) – maybe by witnessing us apologising to each other more she might realise its not such a hard word after all. You are so right that children mirror the behavior they see. I call them little sponges, soaking up literally everything! I like your plan for accountability. It sets a good example for them to follow. So important to teach a child that its okay to be wrong and to say I’m sorry. I’ve continued to apologize to my child, he’s 34. Amy Stainthorpe — Thank you for the read and for sharing your feedback and experience! I know for my son (4 year-old) it’s a word he uses throughout the day, and for my niece (who is the same age), it’s a word that she uses only when pushed to do so, and by pushed, I mean PUSHED sternly. I have a feeling that I will have a similar situation with my toddler (currently 15 months old) as I do with my niece. I try to keep in mind that they are all different personalities and give myself grace to learn what they need and how they learn in order to best equip them with lifelong tools. I appreciate you and look forward to continue learning from each other. Anna Becker — I completely agree, they are little sponges! They soak up and regurgitate everything they see and hear. My children keep me on my toes and remind me to continue practicing accountability with myself because they will eventually be mirroring it back to me. bodynsoil — Thank you for the read and sharing your experience with me! You’ve affirmed my parenting plan. It really does take a village to grow a healthy and conscious child. I appreciate you.